Yes, I know it's been a while since my last post, but I've been trying to keep abreast of my illustration assignments. The latest Media class project is another pen and ink illustration. The requirement was that everyone had to include a man (or woman), a pet, and a machine. Actually, it is a pretty flexible arrangement because a cybernetic wolf-man covers all the bases at once. 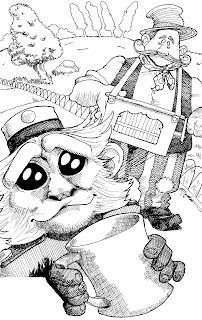 I chose an organ grinder and his monkey because "you can't go wrong with a monkey." I had fun with textures and deliberately wonky perspective.